Jacob David Sudol writes intimate compositions that explore enigmatic phenomena, the inner nature of how we perceive sound, and novel connections between Eastern and Western musical cultures. His music has been performed well one hundred and fifty times by many prestigious ensembles and performers across the USA as well as in Canada, Taiwan, the United Kingdom, Germany, Netherlands, Mexico, Singapore, China, Thailand, Japan, Korea, and Cambodia. Dr. Sudol is an Associate Professor of Music Technology and Composition and the Music Technology Coordinator at Florida International University in Miami, Florida. In 2018, FIU awarded Dr. Sudol a Faculty Award for Excellence in Research & Creative Activities. He was also awarded a 2015-16 Fulbright Senior Scholar grant to research and teach at National Chiao Tung University in Taiwan. Dr. Sudol’s music has been commissioned and performed by many prestigious ensembles and performers such as the Nouvel Ensemble Moderne, Jennifer Choi, Mari Kimura, Kate Stenberg, Little Giant Chinese Chamber Orchestra, Andy Kozar, the Living Earth Show, Jason Calloway, Sarah Cahill, Insomnio Ensemble, Amernet String Quartet, Dal Niente Ensemble, Xenia Pestova, Keith Kirchoff, Luis Tabuenca, Chai Found New Music Workshop, the Aurora Borealis Duo, Chen-Hui Jen, Stephanie Aston, the McGill Contemporary Music Ensemble, Solomiya Moroz, and the FIU Laptop and Electronic Arts (FLEA) Ensemble. 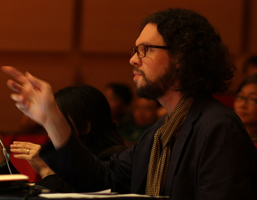 Dr. Sudol’s music has been presented in distinguished venues such as the International Computer Music Conference, Zentrum für Kunst und Medientechnologie Karlsruhe, the Music at the Anthology Festival, the annual SEAMUS Conference, Visiones Sonoras Festival, the Burapha International Music and Performing Arts Festival, the Taipei International New Music Festival, the Felix Mendelsohn-Bartholdy Theater in Leipzig, the New York City Electronic Music Festival, Domaine Forget Festival of New Music, Root Signal Electronic Music Festival, the International INTER/actions Symposium on Interactive music, the international Taiwan Workshop of Computer Music and Technology Conference, TPAM in Yokohama, Studio for Electronic Music in Amsterdam, Taiwan National Recital Hall, the annual Florida Contemporary Music Festival, Rice University, Mills University, Stanford University, University of North Texas, the University of California in San Diego, McGill University, the Spectrum in New York City, Wesleyan University, the wulf in Los Angeles, the Florida Electro-Acoustic Student Festival, the Cluster Festival, Xiamen University of Technology, California Institute of Arts, Bowling Green University, Bangor University, Art Basel Miami, the Atlantic Center for the Arts, and the ISCM New Music Miami Festival. Dr. Sudol has also been invited to give dozens of lectures and be a guest artist at multiple universities and festivals across the USA, Taiwan, Thailand, China, and Cambodia. His compositions for instruments and electronics are also regularly selected for the most prestigious annual national and international computer music and electronic music conferences. Dr. Sudol is also currently writing a chapter on his music for the upcoming Oxford University Handbook on Spectral Music. Dr. Sudol is regularly in demand as a recording engineer and producer. In these capacities he has worked with artists such as Chinary Ung, Roger Reynolds, Steve Schick, Red Fish Blue Fish, Tom Buckner, Jason Calloway, and the Amernet String Quartet. These recordings have been released on albums published by Mode, Bridge, Albany, and Centaur Records. In 2012, Dr. Sudol founded a cello/electro-acoustic duo with the distinguished cellist Jason Calloway and, since 2010 he has been in a piano/electro-acoustic duo with his wife Chen-Hui Jen. At FIU he has directed FLEA (the FIU Laptop and Electronic Arts Ensemble) since 2011 and, from 2015 to 2016, he directed CLOrk (the National Chiao Tung University Laptop Orchestra). Dr. Sudol also regularly collaborates on interdisciplinary projects with visual artist Jacek Kolasinski, architects Eric Goldemberg and Veronica Zalcberg, as well as the internationally renowned Cambodian choreographer/dancer Chey Chankethya and the Cambodian Amrita Performing Arts dance troupe.